A homemade vegan stuffed tomato recipe filled with a rice and veggie mixture and topped off with a bit of vegan cheese. 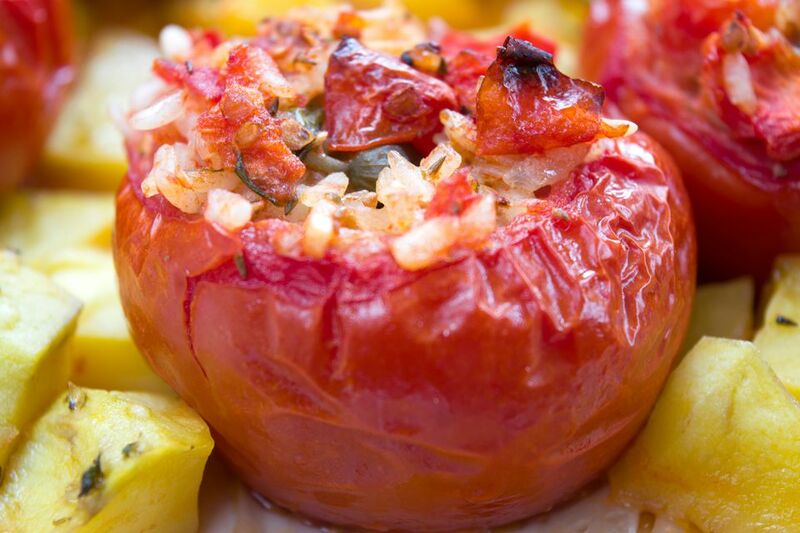 Vegan stuffed tomatoes can be served as an appetizer, side, or main dish. It's a great way to use up leftover rice. Prepare tomatoes by slicing a bit off the top, then scooping out the inner pulp. Place each tomato in a muffin tin, or, slice a bit off the bottom to create a flat surface and place on a baking sheet. Saute the onion and green bell pepper in oil until soft, about 4 to 5 minutes. Add peas, rice, and garlic and onion powder, stirring to combine, then remove from heat. Stir in 1/4 cup grated vegan cheese. Gently fill each tomato with the rice and vegetable mixture. Sprinkle a bit of extra vegan cheese on the top of each tomato. Bake for 12 to 14 minutes, or until tomatoes are cooked and cheese is melted.